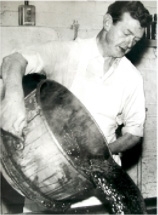 The home of the famous Yorkshire Mixture, Joseph Dobson’s is a fascinating story of a family owned business which has prospered to become one of the largest family owned confectionery business in England. 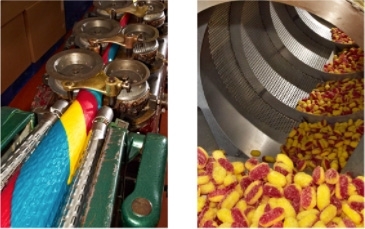 The company continues to manufacture high quality boiled sweets and lollipops to traditional recipes meeting all the challenges of a 21st century market place but also still maintaining the ‘old fashioned’ tastes and traditions of the 19th and 20th centuries. 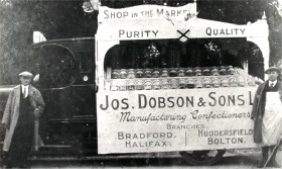 Joseph Dobson & Sons Ltd was founded in 1850 by Joseph Dobson. Joseph was orphaned as the tender age of 10 year old after his parents died from an outbreak of the plague. He was raised in York by his grandparents and worked for a time for the confectioners Cravens of York. Later he married Eleanor Berry who was the sister of William Charles Berry. The Berry family were the joint founders of Terry’s of York in the 18th century. Joseph and Eleanor moved from York to Elland in 1850 to claim Joseph’s inheritance. On arrival in Elland however, they found that only some land and buildings remained as the solicitor acting as trustee had disappeared with all the money. Despite that setback Joseph and Eleanor set up their own confectionery business producing Bridal Cakes and Funeral Biscuits which were popular in the Victorian times. Joseph and Eleanor had seven children and after Joseph’s death, his three sons Robert Henry, William Charles and Thomas John each took a turn managing the business. The company has been owned and managed by direct descendants of Joseph right up until the present day and each generation has passed down their expertise and experience to each of the five generations involved in the business and eventually to the current Chairman, Miriam Walshaw, the great-great grand-daughter of Joseph and her husband Stephen Walshaw who moved from Canada in 1999 to continue the family legacy. Many of the first sweets introduced had medicinal value and some like the current day Voice Tablets, still remain. The turn of the century saw the introduction of the ‘Conversation Lozenge’ which were inscribed with mottoes such as ‘Take ye not to strong drink’, ‘Always speak the truth’ and ‘Honour thy Parents’. The famous Yorkshire Mixtures were named entirely by accident as it is said that one day whilst Thomas John (Joseph’s son) was carrying a tray of sweets downstairs, he slipped and fell and when he looked down to see the jumbled mass of sweets he was inspired to create the now famous Yorkshire Mixture variety. Dobson's continue to manufacture and package their products in the original factory in Elland, West Yorkshire. The factory buildings are set around a cobbled courtyard and grooves can still be seen in the flagstones in the passageway leading to the courtyard which were used to help horses get a better grip when pulling the delivery carts. Continuing to manufacture in these Victorian buildings often presents logistical challenges however it also creates a special ambience which helps to maintain the history and heritage. In 1999, Dobson’s bought a lollipop company called Ryburn and moved production of the 20 varieties of lollipops and Old Tom cough sweets to their factory in Elland. This proved to be a very successful move and the lollipops made an excellent addition to the traditional sweets that that make up the Dobson’s confectionery products family. The lollipop range has now expanded to include a total of 51 different varieties and these along with over 50 varieties of sweets can be found in a wide range of wholesale and retail outlets including traditional sweet shops, supermarkets and department stores. Dobson’s have been supplying a variety of customers (including several supermarket chains, large cash and carry outlets, department stores and the smaller independent shops) for many years. In 2005 it was decided to work towards achieving a highly recognised food accreditation certificate with the BRC. This was achieved in 2006 and Dobsons are proud to consistently achieve the highest grade of BRC accreditation since. More recently, there have been several new areas of development within the company including a large expansion to the factory in 2010 and the purchase of several new manufacturing lines and packaging machines. In 2013 Dobson’s purchased a second factory in Elland which is also used for the manufacturing, packaging and storage of products and this has also helped to ensure the demands and growth are met in this continuously busy and challenging market place. There are over 50 members of staff which make up the Dobson’s team and many of which have worked for the company for many years. 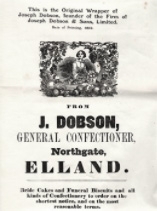 Dobson’s also have their own retail shop in the centre of Elland which provides customers with a vast choice of English and Continental confectionery products in a traditional environment.